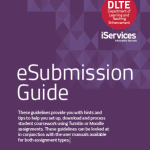 These guidelines provide you with hints and tips to help you set up, download and process student coursework submissions using Turnitin or Moodle assignments. These guidelines should be looked at in conjunction with the step by step user manuals which are linked in the appropriate sections. We recognise that all assessments are different and you may need to use features we have not discussed here, or benefit from talking through options before deciding what approach to take. Please contact the Learning Technology Support Team or attend one of the training and support events and we can discuss the specific needs of your assessment.